MEXICO CITY, Jan 11 2017 (IPS) - “We are absolutely fed up with the government’s plundering and arbitrary decisions. We don´t deserve what they’re doing to us,“ said Marisela Campos during one of the many demonstrations against the government´s decision to raise fuel prices. Campos, a homemaker and mother of two, came to Mexico City from Yautepec, 100 km to the south, to protest the recent economic decisions taken by the administration of conservative President Enrique Peña Nieto. “Everything’s going to go up because of the gasolinazo“ – the popular term given the 14 to 20 per cent increase in fuel prices as of Jan.1, said Campos, while she held a banner against the measure, in a Monday Jan. 9 demonstration. The measure unleashed the latent social discontent, with dozens of protests, looting of shops, roadblocks, and blockades of border crossings throughout the country, carried out by trade unions, organisations of farmers, students and shopkeepers. The simultaneous price hikes for fuel, electricity and domestic gas were a spark in a climate of discontent over growing impunity, corruption and social inequality. The protests, which show no signs of subsiding, have led to at least six deaths, some 1,500 people arrested, and dozens of stores looted. “We are opposed to Peña Nieto’s way of governing. The price rises and budget cutbacks have been going on since 2014. 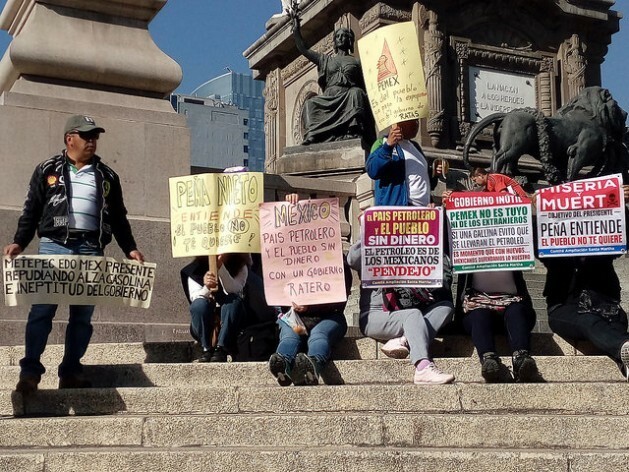 Now there will be an increase in the cost of the basic food basket and transport rates,“ Claudia Escobar, who lives on the south side of Mexico City, told IPS during another demonstration. In response to the social discontent, the government argued that the price rises were in response to the increase in international oil prices since the last quarter of 2016, and insisted that without this measure, budget cuts with a much more damaging social impact would have been necessary. But the rise has its origin more in the elimination of a fuel subsidy which up to 2014 absorbed at least 10 billion dollars a year, as well as in the state-run oil company Pemex’s limited productive capacity. To this must be added the government’s tax collection policy, where taxes account for 30 per cent of the price of gasoline. In addition, energy authorities seek to make the fuel market more attractive, because its freeing up is part of the energy reform which came into force in 2014, and opened the oil and power industries to private capital. Peña Nieto, in office since December 2012, promised Mexicans that this energy reform would guarantee cheap gasoline for the domestic market. Pemex’s oil extraction has been in decline since 2011, and in 2016 it fell 4.54 per cent in relation to the previous year. In November, crude oil production amounted to 2.16 million barrels a day, the lowest level in three decades, due to an alleged lack of resources to invest in the modernisation of infrastructure. Gas and diesel production suffered a similar decline over the past two years, with a 15.38 per cent decrease between 2015 and 2016, when Pemex refined 555,200 barrels equivalent a day of both fuels combined. This forced a rise in fuel imports, mainly from the United States, with Mexico importing in November 663,300 barrels equivalent a day, 15.88 per cent more than in the same month the previous year. Traditionally, Pemex contributed 33 per cent of the national budget, but the collapse in international prices since 2014, and its contraction in activity, reduced its contribution to 20 per cent, which compels the government to obtain income from other sources. For Nicolás Domínguez, an academic at the state Autonomous Metropolitan University, the government is facing the complex situation with “simplistic and incomplete“ explanations. “It is too big of an increase. It is a very big, direct and precise blow to people’s pockets. They are feeling it. People do not understand the reform, because they don’t read laws, not even those on taxes.“ he told IPS. The common prediction of critics of the gasolinazo is its impact on the cost of living, which in the last few months has been spiraling upwards, with inflation standing at around 3.4 per cent by the end of the year, according to still provisional figures. The non-governmental organisation El Barzón, which groups agricultural producers, warns that the price of essential goods could climb by 40 per cent over the next months. According to 2014 official figures, 46 percent of Mexico’s 122 million people were living in poverty – a proportion that has likely increased in the last two years, social scientists agree. The gasolinazo canceled out the four percent rise in the minimum wage adopted this month, which brought the monthly minimum to 120 dollars a month. As demonstrated by the Centre for Multidisciplinary Analyses of the Mexico National Autonomous University, the minimum monthly wage, earned by about six million workers, does not satisfy basic needs. In its “Research Report 126. The minimum salary: a crime against the Mexican people,“ the Centre concluded that the minimum wage has lost 11 per cent in buying power since Peña Nieto took office. The study states that it takes three minimum wages just to put food on the table. To make matters worse, Mexico’s economic growth will range only between 1.5 and 2 per cent, and a further weakening of the economy is possible, according to several projections, due to the impact of the protectionist policies of Donald Trump, who will take office as U.S. president on Jan. 20. In an attempt to calm things down, Peña Nieto presented this Monday Jan. 9 an “Agreement for Economic Strengthening and Protection of the Domestic Economy,“ which includes a 10 per cent cut in the highest public sector wages. But for observers, these are merely bandaid measures. “What the government wants is to calm people down. These are small remedies and what people want is a drop in gas prices. The question is what direction do they want Mexico to move in. If it is about improving the well-being of families, this is not the best way. If the demonstrations spread, the government will have to back down,“ said Domínguez. For people such as Campos and Escobar, the starting point is reversing the increase in oil prices. On February 4 there will be another price adjustment, another spark to the burning plain that Mexico has become. I have new respect for the Mexicans. Of course the deaths and injuries are unfortunate but we never did anything like that here in the United States when gasoline rose to around $4 per gallon a few years ago. The best solution would be to abolish government control over gasoline prices and let the free market determine them. The competition would likely cause prices to decrease.